Nationality: British. Born: Lancashire, (some sources say Warrington, Cheshire) 7 February 1945. Education: began drama school at age 24. Family: longtime relationship; one son. Career: Teacher; began acting, 1970; theater acting credits include performances at the Manchester Royal Exchange, the Bristol Old Vic, and the Liverpool Everyman; member of the Royal Shakespeare Company from (?) until 1987; played Paula's father, Needle TV series, 1990; appeared as guest on several television programs. Address: 4 Windmill Street, London W1P 1HF, United Kingdom. Gerrard, Nicci, "What Do You Call a Man Who Says No to Spielberg? Er, Pete . . . ," in The Observer (London), 20 July 1997. Morrish, John, "Peter the Great," in The Times (London), 4 October 1997. Hattenstone, Simon, "Make Mine a Large One," in The Guardian (London), 8 October 1997. Rampton, James, "Doesn't Do Much, Does He?" The Independent , 22 December 1998. Duncan, Andrew, "There's No Delight in Doing What I Know I Can Do. Danger Ensures You're Alive," in Radio Times , 17 April 1999. Pete Postlethwaite's face offers an irresistible field for similes. At the Bristol Old Vic, where he trained, the Principal told him he had a face "like a stone archway." His craggy features have since been likened to "a bag of spanners" and "a smashed-up wall," and one critic was moved to write of Postlethwaite's cheekbones "boiling out of his head like swollen knuckles." In the film world of perfect teeth, plastic surgery, and flawless complexions, Postlethwaite is the most improbable of movie stars. Yet he's rarely had a day out of work since he took up acting in 1970, his screen presence commands attention, stealing scenes without visible effort, and his range is impressive and still actively extending. He is, in Steven Spielberg's opinion, "probably the best actor in the world today." Inevitably, given his raw-hewn looks and down-to-earth name and background, Postlethwaite has collected his fair share of working-class roles, several of them among his best. His strong facial structure can readily suggest menace; but also a wistful vulnerability, equally convincing as the harsh domestic tyrant of Terence Davies' Distant Voices, Still Lives and as the dedicated bandmaster, doggedly fighting off terminal cancer, in Brassed Off. In Among Giants he played his first romantic lead (at age 53) with all the wary delight of a man finding love long after he's ceased looking for it; the love scenes between his unemployed Yorkshire Tabourer and Aussie backpacker Rachel Griffiths felt touchingly tentative, neither one quite sure what they were getting into. For his Oscar-nominated performance as the unjustly jailed Guiseppe Conlon in Jim Sheridan's political drama In the Name of the Father , Postlethwaite drew powerfully on his Lancashire roots, basing the character on his own father, "an extraordinary man . . . simple, unaffected, sweet, straightforward." Achieving the notoriously difficult feat of playing good without seeming sanctimonious or smug, he portrayed Conlon as a man with a quiet, unflinching sense of moral rightness who attains tragic stature in adversity. His long, expressive face conveyed sadness and bewilderment at the injustice inflicted on him, but also an unbreakable, instinctive dignity. Postlethwaite's range extends far beyond working-class heroes (or villains), taking in light comedy, action movies, horror, noirish thrillers, and Shakespeare. He actively seeks diversity, relishing the challenge. "There's no delight in doing what I know I can do. . . . The danger ensures you remain alive. All these different parts keep me fresh and still loving what I do." As Friar Lawrence in Baz Luhrmann's exhilaratingly revisionist Romeo + Juliet he kept his performance tuned into the film's fizzing Latino-punk rhythms while anchoring it in the bedrock of his solid stage-Shakespeare grounding. For Spielberg's second dinosaur romp, The Lost World , he played the big-game hunter Roland Tembo with clipped upper-class tones and a wry hint of seen-it-all self-mockery. But perhaps Postlethwaite's most relishably unpredictable performance to date was as Kobayashi, soft-spoken enforcer for the mysterious Keyzer Soze in Bryan Singer's labyrinthine thriller The Usual Suspects. Faced with the task of playing a blatantly non-Japanese lawyer with a Japanese name, Postlethwaite elected to give his character a remote, fastidious spin, an air of Zen-like calm and the faintest hint of an Indian accent, that positioned him midway between the Dalai Lama and an English butler. 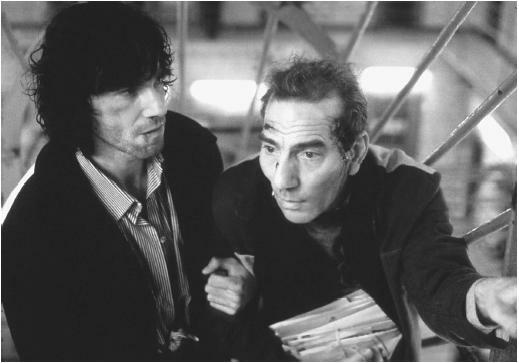 His multi-layered rendition added further to the enigmas of a film in which nobody and nothing could be taken at face value, and proved conclusively that Pete Postlethwaite's ability to confound audience expectations is as yet far from being exhausted.